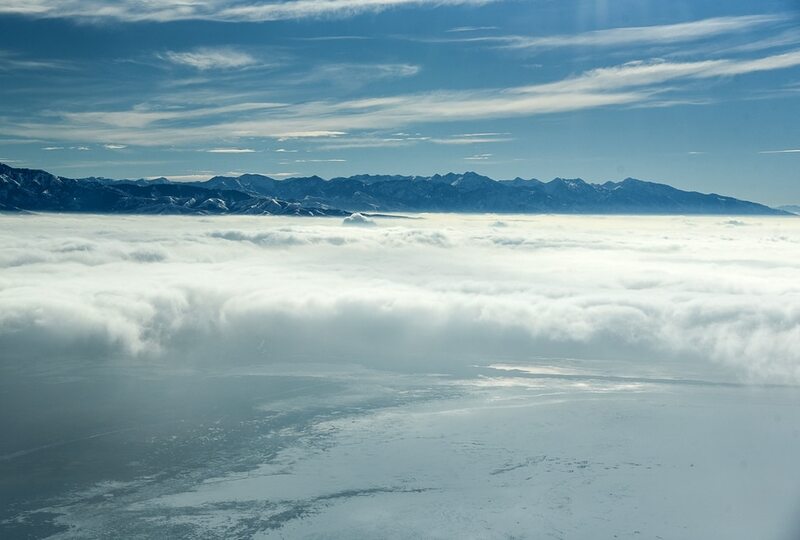 (Francisco Kjolseth | The Salt Lake Tribune) The Promontory Mountains and the Wasatch Range beyond push through the deteriorating air quality under inversion conditions on Monday, Jan. 14, 2019, obscuring the ground below as pilot Jeff Greenland takes every opportunity to fly above the poor conditions. Over the radio with Salt Lake Approach before landing he can be heard saying thanks for keeping us all safe during the shutdown, as the longest government shutdown in U.S. history drags on. (Francisco Kjolseth | The Salt Lake Tribune) The Salt Lake Valley air quality continues to deteriorate under inversion conditions on Monday, Jan. 14, 2019, obscuring the ground below as pilot Jeff Greenland takes every opportunity to fly above the poor conditions. Over the radio with Salt Lake Approach before landing he can be heard saying thanks for keeping us all safe during the shutdown, as the longest government shutdown in U.S. history drags on. 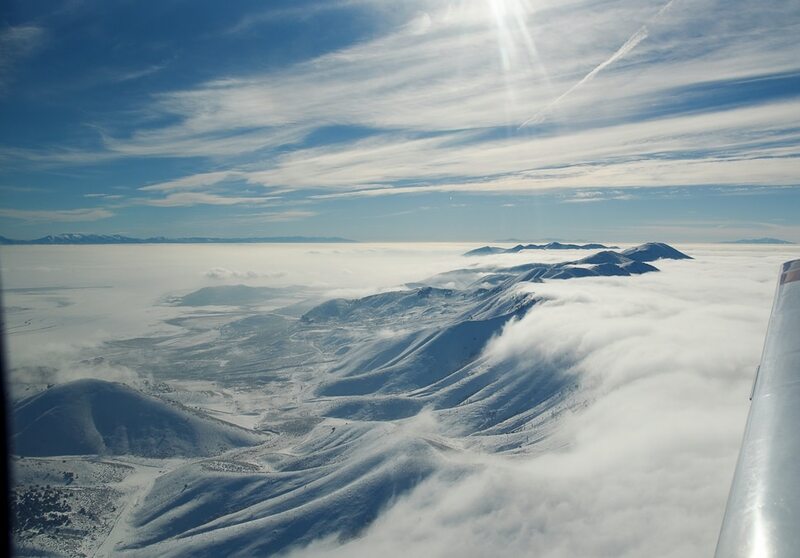 (Francisco Kjolseth | The Salt Lake Tribune) The Promontory Mountains and the Wasatch Range beyond push through the deteriorating air quality under inversion conditions on Monday, Jan. 14, 2019, obscuring the ground below as pilot Jeff Greenland takes every opportunity to fly above the poor conditions. Over the radio with Salt Lake Approach before landing he can be heard saying thanks for keeping us all safe during the shutdown, as the longest government shutdown in U.S. history drags on. (Francisco Kjolseth | The Salt Lake Tribune) Refinery row in North Salt Lake is obscured by poor air quality as inversion conditions continue on Monday, Jan. 14, 2019, obscuring the ground below as pilot Jeff Greenland takes every opportunity to fly above the poor conditions. Over the radio with Salt Lake Approach before landing he can be heard saying thanks for keeping us all safe during the shutdown, as the longest government shutdown in U.S. history drags on. 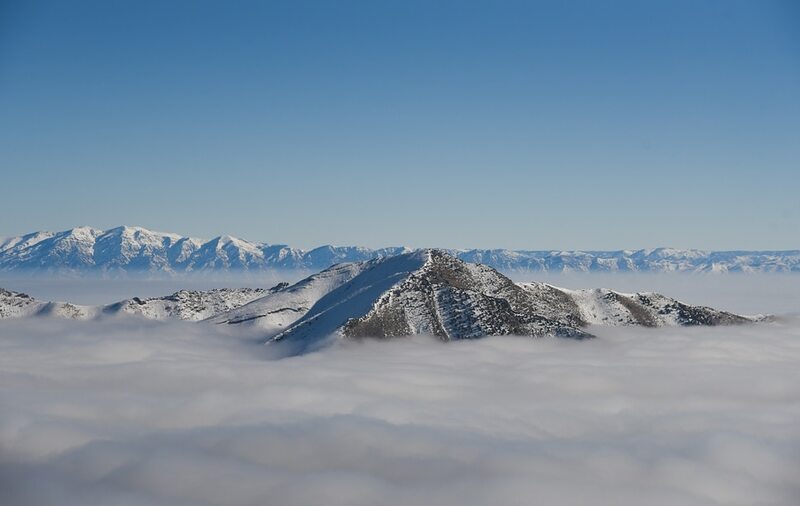 (Francisco Kjolseth | The Salt Lake Tribune) The Promontory Mountains and the Wasatch Range beyond push through the deteriorating air quality under inversion conditions on Monday, Jan. 14, 2019, obscuring the ground below as pilot Jeff Greenland takes every opportunity to fly above the poor conditions. Over the radio with Salt Lake Approach before landing he can be heard saying thanks for keeping us all safe during the shutdown, as the longest government shutdown in U.S. history drags on. (Francisco Kjolseth | The Salt Lake Tribune) Antelope Island and the Oquirrh Mountains beyond poke up beyond the deteriorating air quality under inversion conditions on Monday, Jan. 14, 2019, obscuring the ground below as pilot Jeff Greenland takes every opportunity to fly above the poor conditions. Over the radio with Salt Lake Approach before landing he can be heard saying thanks for keeping us all safe during the shutdown, as the longest government shutdown in U.S. history drags on. (Francisco Kjolseth | The Salt Lake Tribune) The Wasatch Range is illuminated above Bountiful as the air quality continues to deteriorate under inversion conditions on Monday, Jan. 14, 2019, obscuring the ground below as pilot Jeff Greenland takes every opportunity to fly above the poor conditions. Over the radio with Salt Lake Approach before landing he can be heard saying thanks for keeping us all safe during the shutdown, as the longest government shutdown in U.S. history drags on. (Francisco Kjolseth | The Salt Lake Tribune) The Salt Lake Valley air quality continues to deteriorate under inversion conditions on Monday, Jan. 14, 2019, obscuring the ground below as pilot Jeff Greenland takes every opportunity to fly above the poor conditions. Over the radio with Salt Lake Approach before landing he can be heard saying thanks for keeping us all safe during the shutdown, as the longest government shutdown in U.S. history drags on. The air quality in the valley along the Wasatch Range continued to deteriorate under inversion conditions on Monday, and relief was not expected to come until later in the week. With an ominous layer of haze hanging in the sky, Monday’s air quality rating lingered at “moderate,” with burning prohibitions in effect — and conditions were expected to worsen. In Salt Lake County, Tuesday’s air is expected to be “unhealthy for sensitive groups,” such as seniors, children and people with respiratory or heart ailments, according to a forecast from the state. Wednesday’s air is expected to return to moderate; that’s when storms may finally reach the Salt Lake Valley, said National Weather Service meteorologist Christine Kruse. Expect to breathe easier by Thursday at the latest, she said. “Some areas may clear Wednesday, and the rest on Thursday,” Kruse said. During a flight above the Salt Lake Valley on Monday, haze obscured the ground below as pilot Jeff Greenland took every opportunity to fly above the poor conditions. Over the radio he told air traffic workers, “Thanks for keeping us all safe during the shutdown,” as the longest government shutdown in U.S. history drags on.